More than 80% of dogs and cats have periodontal disease by the age of 2? In dogs and cats, two-thirds of each tooth is hidden under the gums, so your pet can have dental disease without you realizing it? Bad breath in your dog or cat could be the first sign of a serious dental problem? Enzadent Toothpaste: sorbitol, glycerin, silica, calcium pyrophosphate, calcium carbonate, poultry extract, purified water, cellulose gum, sodium benzoate, calcium lactate, potassium thiocyanate, zinc gluconate, vitamin E, glucose oxidase, lactoperoxidase, lactoferrin, lysozyme. 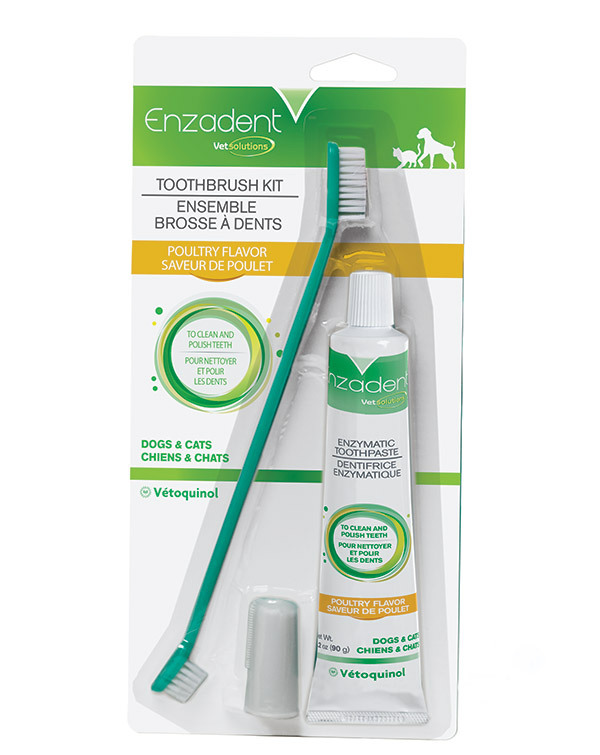 Our Enzadent Oral Hygiene line for dogs and cats also includes a range of products such as toothbrushes, fingerbrushes, and palatable toothpaste to make brushing your pet's teeth easier.